The CB units are used as both clutches and brakes in general power transmissions on all types of machines. 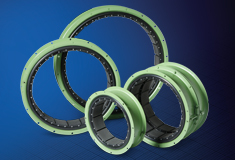 Reliability, low inertia and simplicity of design make the ELASTA-FLEX™ CB an excellent choice for high-speed, cyclical clutch and low- to-medium torque systems. Its integral rim/tube construction makes this a highly adaptable solution, and the tube’s design compensates for imperfect alignment in the driving system while delivering a smooth transfer of power. Offered in a split element.